This new year has brought several changes into my life. I value change because it usually means that I am evolving, life is moving and my future is progressing. I tend to make very few New Year resolutions because with change can also bring uncertainty and I want to be open to all of the opportunities that come my way whether they are for professional or for personal reasons. I think to myself, if I make a list then I am disappointed at the end of the year because I failed or that this list will cause me to be focused in one area of my life and I will miss out on something else. It is probably my mind over thinking the simplest of things: a list. These are just a few things that I have had on my list in previous years, then again, these are things that I am always trying to work on and squeeze into my life. Some of the things on this list will be a little bit harder to find the time for than last year because of the changes I referenced above. The one change that will affect me the most, is our decision to homeschool Isabella. We hummed and hawed about this over the summer and opted to have her start at the elementary school near our home. I needed those few months to work and to figure a few things out with Simply Gourmet, but once my work load eased up I missed her. I missed teaching her and spending the hours each day watching her blossom into a reader, a writer and the unrelenting desire, that she possesses, to learn. Most kindergarteners are eager to learn new things and she is no different. My Mom asked me if my 24 hour a day homeschooling was going well. I laughed because she knows Isabella well---she never is not learning, or doing, or asking questions, or still---her little mind and body are a constant train of motion. I love to learn and I hope that she never loses that desire. Our week has started off well; I feel good about this change. She is also enjoying the process of having more time to spend on certain subjects, more art projects and more reading. It has required that I change the way I work at home a bit, but to me it is worth every late night or early morning. It may sound strange, but I am actually accomplishing more in one day with her home than I did before. I am organized and on top of my schedule-two things I struggled with before Christmas. I could organize Simply Gourmet, but not the house work; or the house was clean but I had not cooked in a week. I was concerned that if I added one more item onto my to do list, it would sink me-I learned that it was what tipped the scale and allowed me to strive and be organized. I think before, I had too much time on my hands and therefore found reasons to not do things because tomorrow was always around the next corner. As you can see, time management will be something that I should add to my list and that is where recipes like this one come in to play. I have heard of making macaroni in the slow cooker before but wasn't sure if it was something I would find appetizing. Not to mention, I was not sure that gluten free noodles would hold up under the heat of being cooked for so long. I thought that the whole dish would turn to mush. I was pleasantly surprised to learn that the cheesy macaroni and cheese turned out creamy, cheesy and full of whole elbow macaroni pasta pieces---not mush. I do believe if you over cook the macaroni and cheese this could be the case, so be careful to not over cook the pasta. I will be honest, if you are looking for Kraft Macaroni and Cheese--this is not the recipe for you. The flavor is mild, the texture creamy and the ingredient list is not long. Using a variety of cheese can change the flavor of this dish so I do encourage you to change those every now and then so that you can find the best blend of cheese for your family. We love combining these types of cheese into ours: cheddar, jack, swiss, fontina, cream cheese and cottage cheese. Not necessarily all at the same time, usually choosing three of the six listed. I can't wait to see what doors will open this new year and how my family and I will respond to the changes that are sure to come. I hope that we will embrace them with open arms, open hearts and with a diligence to persevere--I may be optimistic but I know that not all change can be what we seek or want at any given time. Life can be challenging, that is a given. Boil a large pot of water and cook your noodles for 5 minutes. Do not over cook or cook until tender. Drain and add to the bottom of the slow cooker. In a bowl, combine milks, butter, salt, eggs and cottage cheese. Add cheese and mix. Pour over the elbow noodles and stir. Cook on high for 30 minutes. At the end of the 30 minutes, stir a few times and lower heat setting to low. NOTE: During the two hours I usually stir it one more time. This is because my slow cooker has a tendency to over cook things around the edges. After the two hours you may see a little bit of the milk liquid still on top. Turn heat off, stir this in and let sit for 15 minutes. The mac and cheese will get thicker. If you choose to let it continue cooking, the noodles will get very soggy---still taste good just not texturally pleasing to some folks. I like individual portion sizes and this is how I served mine. See below. 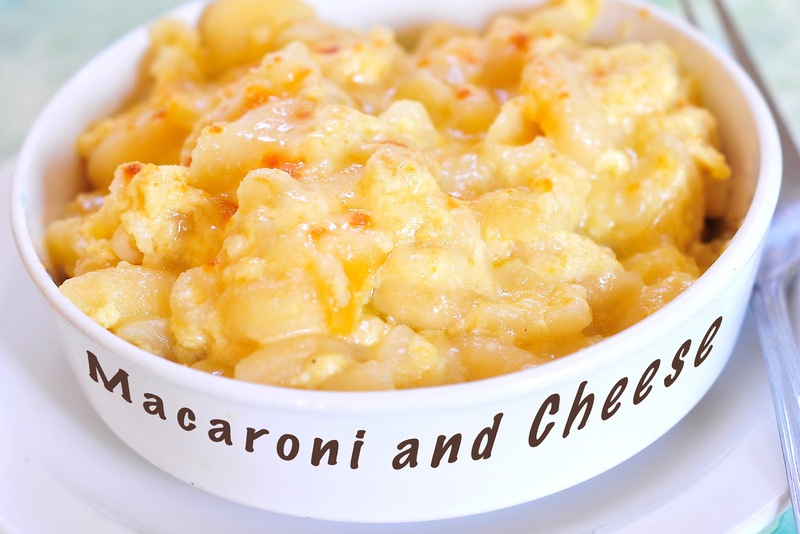 I portioned the mac and cheese into white ramekins, added a bit of parmesan cheese and broiled until the cheese started to brown and melt OR you can add the parmesan cheese to the slow cooker during the last 30 minutes and let it cook into the macaroni and cheese. what a wonderful start to the year, i am happy for you that you are MORE organized with homeschooling Isabella. any time management tips? do you have an online calendar or planning tool you use and recommend? i feel the same that if i cook more, some other mommy duty is sacrificed. i rely on my slow cooker a lot and tried mac n cheese once before. it was too squishy. I look forward to trying this recipe out. thanks!! I just have one calendar on my desk, I have not yet managed to put my calendar on my phone. I also have a to do list that I carry over every day with a few things from the day before, this is really the key to my success---the list! I have all of Isabella's stuff scheduled day by day with a month over view--it takes me three full days to prepare the next month. If I am more organized with her then the other elements in my life naturally fit into place. I feel as though I had too much time before and now I don't spend any time day dreaming…LOL Thank you for your comment. Aw your daughter sounds wonderful! 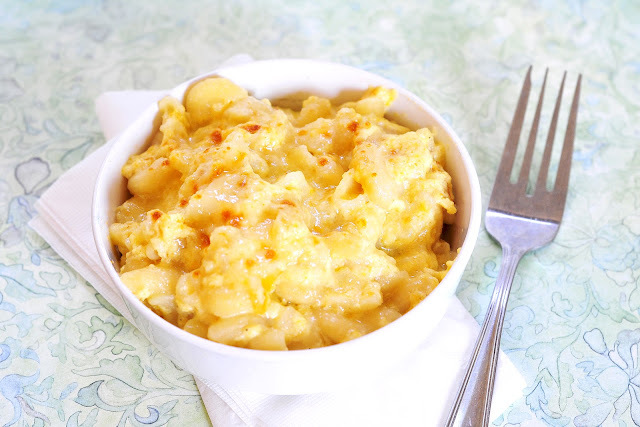 This mac n cheese looks completely rich and creamy and I love that it's made in a crock pot! Curiosity is the best part of youth. I feel like many of us lose that as we get older. It's great that you're remaining so optimistic though! And don't fear, I struggle big time with the time management thing. I've been dying to try slow cooker mac, and this has only increased my desire. Talk about picture perfect! It is so true! I love watching my daughter learn and discover new things each day. Please let me know how this turns out for you and your family. Thank you for taking the time to leave a comment too…I love to hear from my readers! I never would have thought of using cottage cheese in mac 'n cheese. What a great idea! Is there any way you could cook it in the slow cooker ahead of time, cool it in the fridge, and then spoon into ramekins the next day to reheat and brown the top? Trying to do as much ahead of time as possible for the big game on Sunday. Go Ravens! Yes, I do think that would work. I might suggest that you don't cook it for the full time, maybe cut off 30 minutes, as the noodles will continue to cook as they cool. It might change the texture a bit but should not alter the flavor. Best of luck! My main question - the ingredients call for 3 eggs but I don't see where / when you're supposed to add them! HI Rachel--Thank you for the question. You are right, I forgot to include the eggs with the other ingredients. I updated the recipe to reflect this. Have a great day! Hello, my son is Celiac and will go bonkers for this GF mac 'n cheese! He is diabetic also, so I have to ask ... do you have any idea how to calculate the carbs for this recipe? TIA for your time. I hope this helps and please let me know how your son enjoyed the recipe. Hello everyone, it's my first pay a visit at this website, and piece of writing is truly fruitful designed for me, keep up posting such posts. a regular visitor for a drawn-out duration. Precisely why did we hear it say "kill the mother and parent"? Spectacular job with your site. Maintain up with the fabulous work. The tip's are master pieces.I think it'll be of awesome help. Hi Erin, I don't know if it would work or not because I have always included the cottage cheese. If you decide to remove this ingredient you will want to replace it with something else, maybe cream cheese or ricotta or another soft cheese.